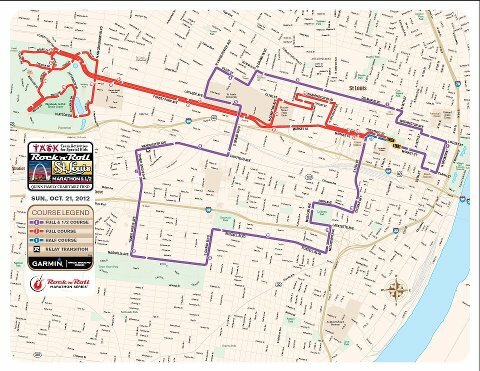 Here’s the newly announced course for the St. Louis Rock and Roll Marathon. It was just released yesterday. If all the ink on this map isn’t intimidating enough…check out the hills. Steepest is at mile 1. Yesterday I did my 3 miles (according to Hal Higdon‘s plan for Novice 2). I knew better than to do this, but I kept moving back and forth from black top to shoulder due to traffic – instead of just staying on rocky shoulder of road. Well, after 2 miles I started to move off of the road again to allow a car to pass and rolled my ankle. At the time it didn’t hurt but just scared me. Later in the day pain started in my heel and then moved to just under the ankle bone on right side of right foot. I did the ice, rest and Ibuprofen routine (got some advice from Coach Castle) and it’s much better today. Fortunately today is a rest day in preparation for tomorrows 11 mile run. I’m downing lots of water/sports fluids/complex carbs today for fuel. Will catch you on the other side! This entry was posted in Fitness, Injury, running, Training. Tagged Ankle, Hal Higdon, Ibuprofen, Marathon, Mile run, Rock and roll, Running, Sports, St. Louis Missouri, United States. The course looks like a doozie! Good luck on your long run tomorrow!